Tika Sumpter, Carmen Ejogo and Jordin Sparks as singing siblings in “Sparkle.” Photo courtesy of Sony Pictures. CANDY may not exactly be good for you, but it sure tastes good going down. In comparison to the grittier 1976 original, the big-budget, major studio remake of “Sparkle,” which follows the lives and career of Sparkle Williams and her sisters, is sanitized, sweetened and packaged in a sleek wrapper. Character details and plot lines have been significantly altered – some effectively updating the story for a millennial audience (the title character is now the writer of the songs that she and her sisters perform). Others may be filed under “creative license” (the time and place have been changed from Harlem 1958 to Detroit 1968, for starters). The film opens nationwide today. The differences are too numerous to name in this space, and the exercise would be pointless: “Sparkle” is an entertaining confection that stands on its own merits. Part-melodrama, part-musical, part-“Mad Men”-era fashion show, “Sparkle” manages to counter its clichés with swift pacing and solid acting, including a star-making turn by “American Idol” winner Jordin Sparks as Sparkle. Whitney Houston as a very protective stage mother in "Sparkle." Her performance as a teenage singer/songwriter on the verge of womanhood is charming and naturalistic, and she has musical chops to spare. Carmen Ejogo delivers as her sultry oldest sibling, Sister, portraying the character’s downward spiral with equal skill. 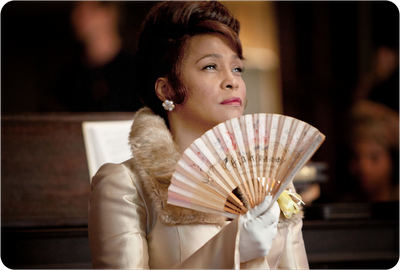 In what would have been her acting comeback, Whitney Houston brings humor and believability to the role of Emma, the girls’ mother. Here, she is reworked as a strict, overprotective parent who incredibly remains unaware of her daughters’ late-night meanderings. The scenes in which she references her troubled past are affecting and evoke pathos when viewed through the filter of the late singer’s drug-related demise. The Williams sisters – Delores, Sparkle and Sister – hope their singing talents can lift them above their station in "Sparkle." Director Salim Akil and screenwriter Mara Brock Akil have added nuanced moments to what is essentially a formulaic story, particularly in developing the subtext for the troubled relationship between Emma and her daughters. However, the ending feels contrived and leaves the audience to ponder such inconsistencies as how Sparkle could afford an apartment and a cover girl-worthy wardrobe on an entry-level worker’s salary. The same goes for how middle sister, Dolores (Tika Sumpter), can seemingly move on after the tragedy that occurs late in the movie with barely a blink of her false eyelashes. Domestic abuse and race riots are frequently glossed over or treated as a joke. Nevertheless, all is forgiven after the stirring ending performance by JS. Sparkle is rated PG-13 for violence and language.